Big Finish: Doctor Who - A LIFE OF CRIME Review | Warped Factor - Words in the Key of Geek. Tony gets away with it. A Life Of Crime is Ace and Mel back together with the Seventh Doctor. 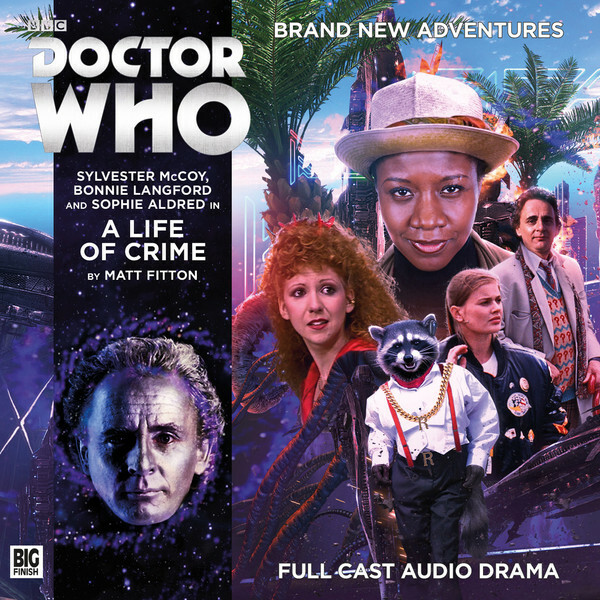 It’s also written by the experienced, inventive Matt Fitton and set on a ‘Planeta Del Crime,’ heavily references one of Robert Holmes’ greatest characters, and includes a black, female Seventh Doctor and what is basically Rocket Racoon on the cover. What could possibly go wrong? Plenty of people will tell you that absolutely nothing can go wrong with A Life Of Crime. Much as I’m generally a fan of Fitton’s work though, this time out, I won’t be one of them. Don’t get me wrong – there’s plenty to love. The glimpse into Mel’s life after she disappears into the cosmos with Glitz, and how it comes to an end, is well handled. The dynamic between Mel and a disappointed Seventh Doctor when they face up to and discuss the way she left the Tardis is better, sharper and as a result more realistic than, say, the oversweetened version with Elizabeth Sladen’s Sarah-Jane and David Tennant’s Tenth Doctor. And there are cute plays on the business of regeneration (and the Sixth Doctor’s regeneration into the Seventh, particularly), and on what each of the Seventh Doctor’s TV companions brings to the time-travelling party, especially after all this time, all these days like crazy paving, with Ace able to fly the Tardis sometimes and Mel no slouch when it comes to cracking a safe or hacking a bank account. In terms of his self-appointment as a teacher of morality, the Seventh Doctor here is becoming a bit of a Fagin figure (‘You got to save a planet or two, girrrrrls – you got to save a planet or two’), running a kind of travelling school for enterprising anarchists. So there is, as we say, plenty to love about A Life Of Crime. Two things mitigate against its complete success though. Firstly, it feels pretty much wrapped up after two episodes, leaving the second whole ‘half’ of the story feeling like it was written on the day of recording, against a deadline of actors needing to speak the lines, and invented on the hoof. The main threat, a species called the Sperevores, while amply described and suitably creepy in terms of their visual, seem to evolve madly throughout the play, from one kind of villain into another, and then another as the script rapidly adapts to a length that seems to take it by surprise. It has every chance of leaving the listener gasping, going ‘Wait, hold on, so they do this, and this…and now THIS?’ None of the things the Sperevores do is essentially bad, in villainous terms – each of them work as ‘things a species of villains could do,’ it’s more or less just the fact that they evolve rapidly to do them all without sufficient bedding in that makes them hard to swallow in this script. Then there’s the other thing. Sadly, it’s also to do with the Sperevores. It must be incredibly difficult coming up with ‘new’ villain-voices and the Sperevores, by their nature, certainly present a very particular challenge – when you realise what they are, you do get the question bobbing about in your brain: ‘What the hell would that sound like?’ Sadly here, there’s lots of sucking and slurping and lisping in the mix, and it makes the Sperevores a singularly tiresome race to talk to – which is unfortunate because, as we mentioned, they turn from one kind of villain to another throughout the course of the script, but one thing they do love to do is talk. That has a tendency to leave you feeling like A Life Of Crime is nearly two hours of getting your ears syringed. But what the hell, right? It’s Mel! And Ace! Together Again!! All of this adds a dimension of pure charm to proceedings here, and there’s excellent work too from Ginny Holder as Gloria, who may or may not be a possible-incarnation of the Doctor (spoilers! There’s a lot of talk here about potential futures, alternative futures and suchlike, just to keep you guessing), and who, along with Ace and Mel is one of the main drivers of this plot. There’s also, if not the ghost of Glitz, then at least the whiff of his beard-softener around every corner of the plot, making the 80s fan wish for an actual appearance from the man himself – too late in Tony Selby’s life for the Glitz spin-off we’ve wanted since the 80s, Big Finish? He appeared in a movie just four years ago. Just saying. That all combines to make A Life Of Crime a bit of a special release. More than anything, the thing that weighs against that is the plot itself, and its seeming to have been overextended and rushed, with quirky elements thrown in more or less just because they could be. Any reason the native inhabitants of Ricosta have to be racoonish creatures? No, but they can be, so chuck ’em in. Any reason for the main threat that develops in episodes three and four? Yyyyes, at a push, although only really because there’s room for it to expand into. Ultimately, A Life Of Crime feels like some great ideas, and some exceptional characterisation work, bogged down in zany elements that give it more of an exhausting feel than it really needs. Overall, of course you should buy A Life Of Crime – if nothing else, it is written by Matt Fitton, and it does bring an older Ace and an older Mel back together in the Seventh Doctor’s Tardis, and there certainly are some gorgeous cheeky moments, including a regeneration, and plenty of mentions of the galaxy’s finest, most reliably unreliable crook and con-man, Sabalom Glitz. It’s just the actual plot that convolutes all the goodness in tentacles and fat-cat bankers and quirky raccoons and cons about as convincing as the one in Time Heist that stops it being an all-time classic. Certainly, it’s true to say that enough classic survives to warrant at least one listen. Whether you’ll come back to it time and time again though pretty much depends on how much you love Ace and Mel – and how often you like getting your ears syringed by many-tentacled, multi-mouthed monetary monsters.